You are here: Home / Kids / 100th post special! Following on from my Bloggy birthday post from Monday, here are some more answers to your questions so you can find a bit more about me! I haven’t been able to answer all of them so apologies if I didn’t get to yours! 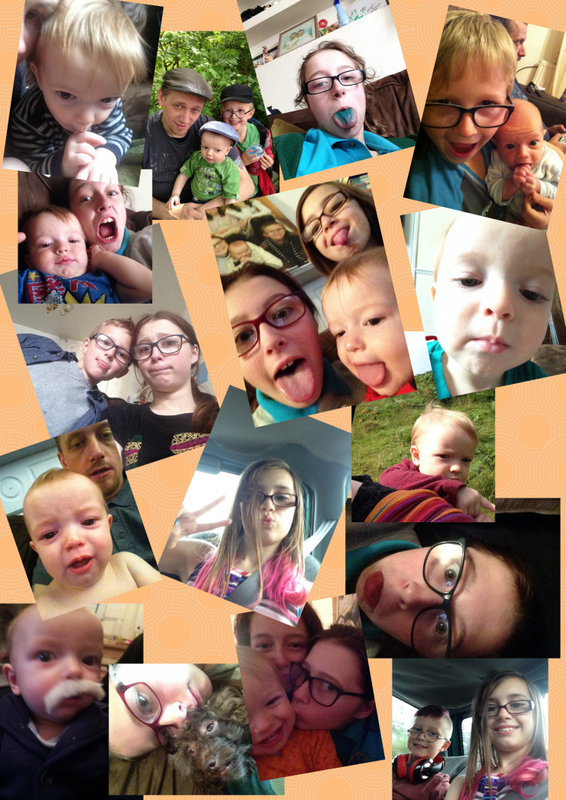 My daughters wanted me to celebrate my 100th post by creating a collage of 100 selfies (of them not me!) from the thousands that they have taken on my phone. There’s no way I was going to crop 100 photos though, so here is just a small selection for you! 1. What inspires you the most to write a blog post? A lot of my blog posts are mostly just inspired by random thoughts that come to me, funny little things like the plates not drying in the dishwasher. These used to be things that I would ponder over myself, have a little giggle and then get on with my day, yes I admit I do often have quite humorous conversations with myself. Now you all get an insight into the weird workings of my brain, aren’t you lucky ;)! Other things that inspire me to write are things that really annoy or upset me like when I wrote about mothers trying to stop their children being gay, or Ashya Kings parents. Our day to day lives are actually quite mundane so I rarely write about that or I’d bore you all to tears so I only write about the more interesting days/events. 2. How on earth do you get everyone up and washed, dressed and ready for the school run? I struggle with one at school and one baby! I don’t, they do it all themselves! With O still being awake a lot in the nights I am pretty useless in the mornings so the 3 girls have gotten used to getting themselves up with the alarm at 6am and eating breakfast. They disappear at 7.30 for the school bus, LV isn’t usually long after them as he likes to walk to breakfast club to see his friends so he often leaves at 7.40am. When the older four were younger it was a completely different story mind! It could be quite manic, especially before I could drive, but making sure everything was ready the evening before was key. My kids get taught quite early on to wash and dress themselves, we’d never have gotten anywhere if I’d tried to do everything for them! One rule that has always helped everything go smoothly is no TV before school. Oh and toast is your best friend, you can’t eat cereal while your running late to school! With the amount of us that need feeding, it is often easier and cheaper to make a roast. During the week it’s nothing special, just some meat, veg, potatoes and gravy. At the weekend I make roasties and Yorkshire puddings too. I love a good Sunday dinner! 4. What’s your favourite pizza topping? I love chicken and sweet corn on my pizza, with BBQ sauce. 5. If you had a child-free day, how would you choose to spend it? 6. If you could be ambassador to ANY brand, who would it be and why? I have had to think long and hard about this one and possibly due to lack of sleep I can’t think of one individual brand. It would have to be a company whose products holds some importance to my life though. Breastfeeding, babywearing and cloth nappies are all subjects that are close to my heart. 7. If you were another person, would you read your own blog? I don’t actually tie my shoes in the first place, I just tuck them inside. So nope! 9. Tea or coffee? Or wine? Wine? No thanks! On the extremely rare occasion that I do drink I’m more of a vodka girl myself! 10. Pen and paper or computer? I adore notebooks and stationary, I own some that are so pretty I just cannot even consider tarnishing them with ink! One of my main aims in life is to own a really posh fountain pen, one of the expensive ones. But I have to be honest I usually write on my laptop. I have a tendency to misplace things so at least then I know where everything is! I hope you enjoyed reading my 100th post special as much as I enjoyed answering all of your questions! Thank you all for a fantastic year and all your lovely comments over the last 100 posts, I can’t wait to read them over the next 100! Do you have a million kid’s selfies on your phone? Not a day (or hour) goes by when I don’t have at least five new ones magically appear! Lovely to read your answers to those questions and I love your photo collage! Aww thanks love. My canva skills leave a lot to be desired but not bad for my first attempt!